Here in Utah, it’s late summer, which means community and home gardens are bursting to the brim with sweet corn, juicy tomatoes, and crisp radishes. When I hear those ingredients, my brain goes straight to Southwestern flavors with lime, chilies, and creamy avocado. Luckily, I already had pretty much everything on hand to create this recipe. I decided to bring it all together by adding some farro and turning it into a grain bowl: at the base we have hearty farro, an ancient Italian wheat berry that is deliciously toothsome and chewy. For toppings: sautéed onions, Pasilla peppers, and corn, along with fresh tomatoes, radishes, and basil. I kind of had pizza on the brain, so I decided to go with fresh mozzarella as a protein choice. Depending on your mood and skin, you might choose steamed shrimp, a scoop of canned beans, or even some roasted chicken. To dress: a luscious, creamy Southwestern avocado sauce. 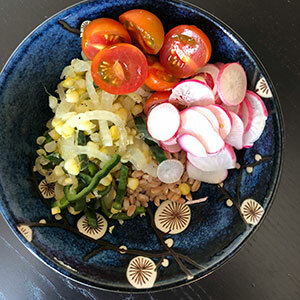 The beauty of grain bowls is that if you have a few different options at the ready to change up your bowl, you can avoid the burnout or boredom that comes with eating the same thing several days in a row. For example, this week I’ll alternate between protein sources and use fresh mozzarella on some days and Cannellini beans on others. Since I only have a few rows of radishes left in my garden, I’ll probably use toasted pumpkin seeds for crunch when I run out. Some days I’ll add and a handful of greens to the bowl and on the last day, when the dressing is inevitably gone, I’ll probably use a store-bought dressing instead. Heat the oil in a large pan over medium high heat. Add onions, season with salt and pepper, and cook until softened, about 3 minutes. Add peppers and cook an additional 1 minute. Add corn and cook until softened but still crisp, about 3 minutes. Season with salt and pepper. For each serving, top ½ cup cooked farro with ½ cup of the onion, pepper, and corn mixture. Add ½ cup each chopped tomato and sliced radish. Finish with 3-4 oz. of protein, dressing and chopped herbs to garnish. Enjoy!